Maybe I’ve seen far too many horror movies but when you’re in a place as bizarre as Bombay Beach you can’t help but constantly look over your shoulder. Once a thriving resort area in the desert east of Los Angeles, it now resembles the backdrop for a George Romero zombie movie. 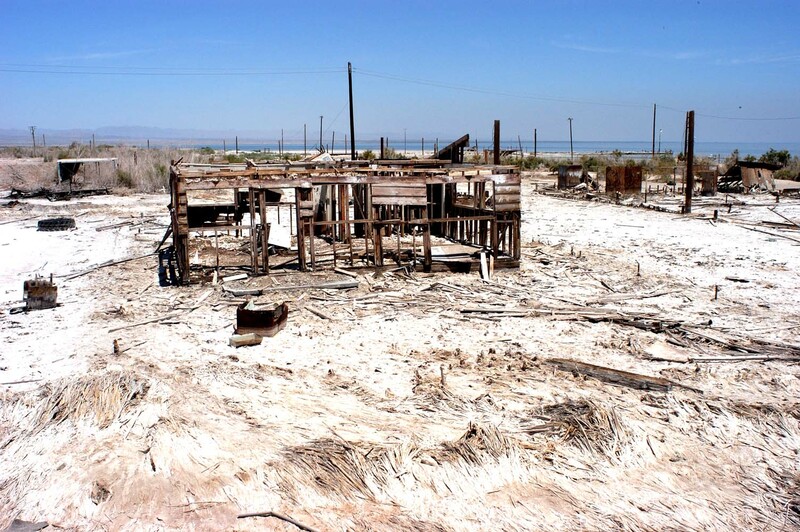 Bombay Beach lies on the shores of the Salton Sea, which is anything but. It’s a lake, covering some 970 square kilometres in the middle of the Sonoran Desert that takes in parts of California, Arizona and north-western Mexico. It lies 69 metres below sea level and, throughout the ages, has alternated between lake and salt pan. In its current state, it was formed in 1905 when the Colorado River broke its banks. In the 1920s, it became a resort area for the growing population of Los Angeles and communities began to spring up on its shores. By the 1960s, the lack of freshwater infill and low rainfall saw salinity levels rise high enough to periodically endanger the fish life. 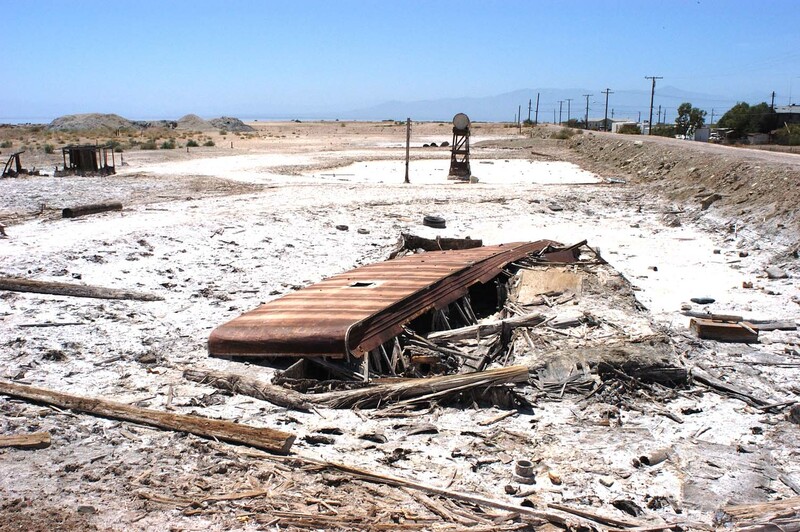 Although boating is still popular, the towns of the Salton Sea withered to the point of death. 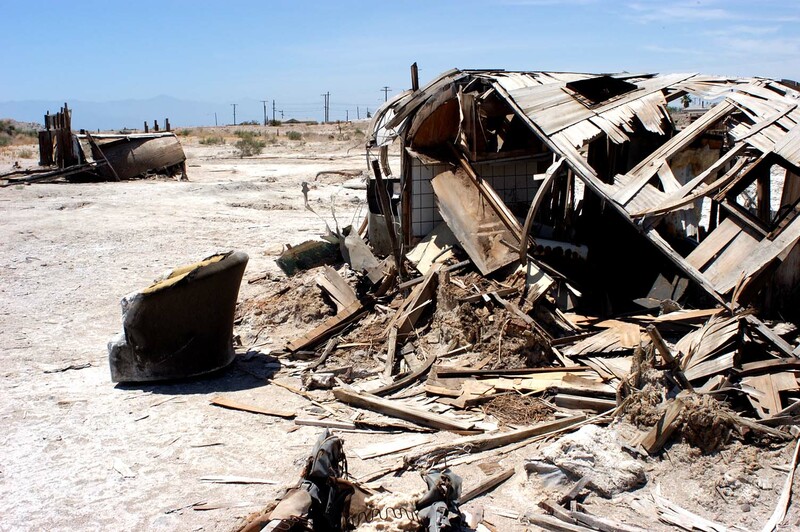 The romantically-named Bombay Beach is just such an example. An hour’s drive north is Palm Springs, a fabulous enclave of mid-century architecture and wealthy celebrity residents, eternally stylish and forever locked in a time capsule of swimming pools, backyard fire pits and a classic car in every Richard Neutra-inspired garage. Turn off the highway, past the sun-parched Welcome To Bombay Beach sign, and you enter another world. The official population hovers around 300 but you’d never know it. Mobile homes, modest cinderblock houses and run-down timber shacks line the streets. There’s a fire department, general store and tavern but, like the streets, they seem abandoned. It doesn’t help that temperatures sit above 40 degrees Celcius throughout summer so the residents aren’t likely to be out welcoming curious tourists but Bombay Beach appears, with its faded air of depression and decline, unlikely to ever win any Tidy Town awards. If Palm Springs is Catherine Zeta-Jones, Bombay Beach is Norma Desmond waiting for the mortician to bury her dead chimpanzee. At the lakefront, where a storm decades ago swamped the town and necessitated the building of three metre-high dirt levee, Bombay Beach becomes a set for the zombie apocalypse. A resort and caravan park was abandoned after almost being washed away; its mobile homes, cottages and outbuildings were slowly pulled into the earth, the salt eating away and almost devouring everything. The silence, along with the pungent stench of thousands of dead fish, is unsettling. Taking photos requires on eye on the viewfinder and another checking for anything odd, or at least odder than this, coming up behind you. The other tourists laugh nervously, get back in their cars and get out of Dodge real quick. My curiosity sated, I do the same. After a quick drive through town, I debate whether to stop at the general store but decide that’s a bit too much like the plot of a horror movie. And everybody knows how that ends up. Confusing, don’t know whether I am rating Sandra’s comment or your post, DL. Particularly like the photos. Looks like you have your very own comment. Thanks for the kind words, Alice. Previous Previous post: Sydney’s Forgotten Glory – The Garden Palace Burns!